catherine-violin: put all questions here please. thanks. bought reward: "an album download of your choice"
catherine-violin: Doctrine and Covenants Section 25 verse 12: "For my soul delighteth in the song of the heart; yea, the song of the righteous is a prayer unto me, and it shall be answered with a blessing upon their heads." Hi my name is Catherine Stay. 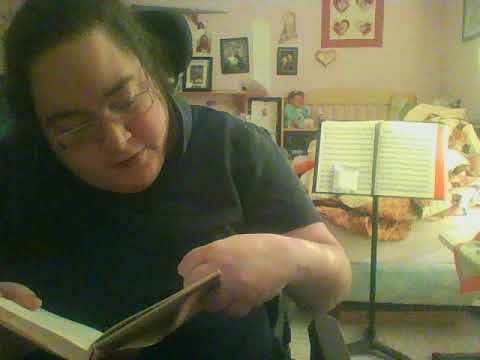 I am 30 years old and I was born with cerebral palsy. I got off rather lucky as far as this disease goes. When I was 12, there was the sixth grade orchestra orientation in which I wanted to play the cello (that didn't work out). I guess my not being able to play the cello in sixth grade led me to play the violin eight years later. About six months after I graduated from high school, I picked up the violin. I have to use a left-handed violin instead of the regular right-handed violin because of my cerebral palsy. Mine is three quarters instead of the normal full-size. I haven't entered any Violin competitions before because of these two reasons: Traveling anywhere is very difficult for me and I'm apparently too old to enter most other competitions.